A document obtained by the National Security Archive reveals for the first time the details of a Cold War spy operation that briefly "borrowed" and studied a Soviet spacecraft that was part of an international exhibition — and then returned it without the Russians ever knowing it happened. The document is an article that appeared in the Winter 1967 issue of the internal CIA journal Studies In Intelligence. Although parts of the article are heavily redacted, much of the complete story remains intact. 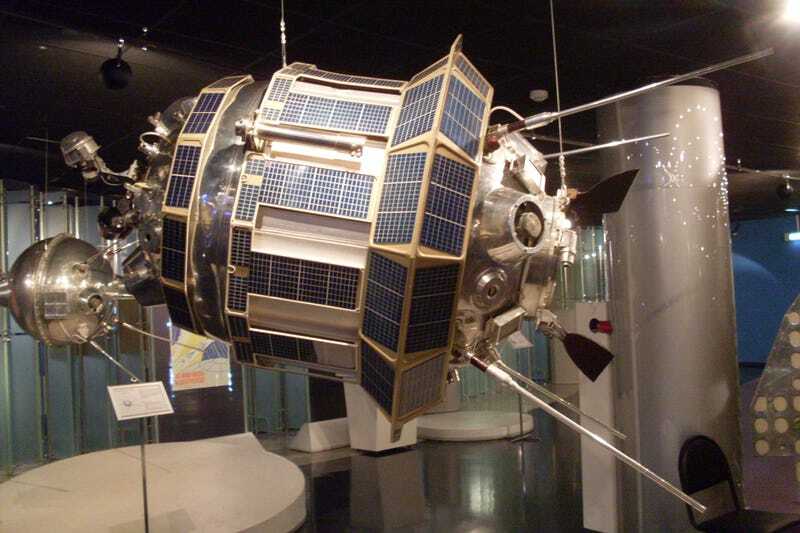 The target of the operation was Lunik (sometimes called "Luna"), a spacecraft that the Soviets sent on several missions to survey the Moon. In 1959, the Luna 2 mission successfully hit the lunar surface, becoming the first human-made object to reach the Moon. It was presumably a mock-up made especially for the exhibition; the Soviets would not be so foolish as to expose a real production item of such advanced equipment to the prying eyes of imperialist intelligence. Or would they? A number of analysts in the U.S. community suspected that they might, and an operation was laid on to find out. After the exhibition closed at [unnamed location], a group of intelligence officers had unrestricted access to the Lunik for some 24 hours. They found that it was indeed a production item from which the engine and most electrical and electronic components had been removed. They examined it thoroughly from the viewpoint of probable performance, taking measurements, determining its structural characteristics and wiring format, estimating engine size, and so forth. The CIA concluded that the vehicle, though stripped of several electronic components, could still yield valuable information about its design and the progress of the Soviet space program. As the exhibition moved from city to city, the CIA examined shipping manifests, to confirm when a crate with dimensions matching those of Lutnik would be delivered. As the exhibition materials were crated and trucked to the rail yard, a Soviet checker stationed at the yard took note of each item when it arrived. He had no communications bade to his colleagues at the fair grounds, however. It was arranged to make the Lunik the last truckload of the day to leave the grounds…. When it was clear that there were no Soviets around, the truck was stopped at the last possible turn-off, a canvas was thrown over the crate, and a new driver took over. The original driver was escorted to a hotel room and kept there for the night. The truck was quickly driven to a salvage yard which had been rented for the purpose. This yard was open to the sky but had a 10-foot solid wood fence around it. Action was suspended for half an hour. Everything remained quiet in the area, and there was no indication that the Soviets suspected anything amiss. The Soviet stationed at the rail yard waited for a short time to see whether any more truckloads were coming. then packed up his papers and went to supper. Then a team carefully unpacked the crate without leaving any evidence of forced entry. The task was made easier by the fact that the planks had been removed and put back several times before, and so were already battered. Our first job was to gain access to the engine compartment by removing the Lunik's large base cap; this was attached to its flange by some 130 square-headed bolts. We removed these with a metric wrench and by using a rope sling moved the heavy cap off to one side. Inside the compartment the engine had been removed, but its mounting brackets, as well as the fuel and oxidizer tanks, were still in place. At the front end of the compartment, protruding through the center of baffle plate that separated the nose section from the engine, was the end of a rod which held the payload orb in place. A four-way electrical outlet acting as a nut screwed onto the end of this rod was keyed by a wire whose ends were encased in a plastic seal bearing a Soviet stamp. The only way to free the orb so as to let the nose team into the basket in which it rested was to cut this wire and unscrew the outlet. We checked with Station personnel and were assured they could duplicate the plastic, stamp, and wire…. The Soviets, in removing all electrical connections and gear, had overlooked two couplings in the basket; these we took back to headquarters for detailed analysis. Before we had finished, the new seal—wire, plastic, and stamp—was delivered to the yard. At 5:00 am, the truck was taken to a prearranged point, where the original driver took over and drove to the rail yard. The Soviet official who had been checking items as they arrived the previous day arrived at 7:00 am, where he found the truck carrying Lunik waiting for him. He checked the crate in and had it loaded onto a flatcar. The train left for its next destination. "To this day," the CIA article concluded, "there has been no indication the Soviets ever discovered that the Lunik was borrowed for a night. "